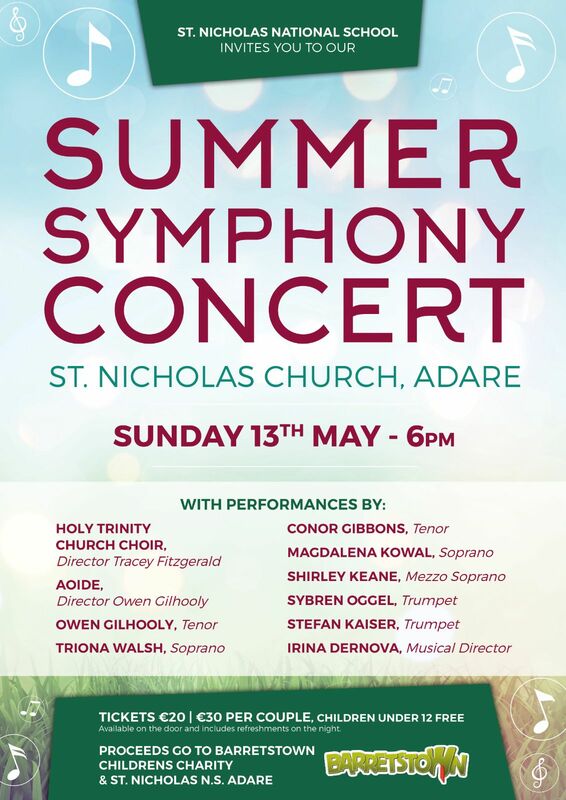 The Summer Symphony Concert in St Nicholas Church Adare on Sunday May 13, promises to be a treat for music lovers. Featuring well known and renowned soloists Owen Gilhooly, Shirley Keane, Triona Walsh, Conor Gibbons and Magdalena Kowal who will perform a variety of well known operatic and musical pieces. The soloists will be joined by Aoide Choir under the direction of Owen Gilhooly and the Holy Trinity Church Choir conducted by Tracey Fitzgerald. The concert, under the musical direction of accomplished pianist Irina Dernova, will be enhanced by trumpet players Sybren Oggel and Stefan Kaiser who will also perform for this special concert, all proceeds from the concert will go to Barretstown Childrens Charity and to St Nicholas National School Adare. Tickets are €20 or €30 per couple and Children under 12 years of age can attend free of charge. Tickets will be available at the door on the night of the concert. Tickets will sell fast so make sure you are there in plenty of time to avoid dissapointment. The Concert commences at 6pm. President of the Castletroy and District Lions Club Rita O’Donoghue, would like to thank all who helped and attended the table quiz in aid of Cliona’s Foundation at the Castletroy Park Hotel on Friday April 21. Though incapacitated at the time of the event Ms O’Donoghue said the evening was a great success in helping to raise funds and awareness for Cliona’s Foundation. Cliona’s Foundation is a Limerick based charity, established in 2007 by Brendan and Terry Ring, that provides financial assistance directly to parents of children with life limiting or chronic complex care needs throughout Ireland, to help with the non medical expenses related to caring for their child. Following the death of their daughter Cliona, from an inoperable brain tumour, Brendan and Terry set up Cliona’s Foundation, in honour of their daughter. Since its launch, the charity has raised in excess of €1.25 million euro over the past 10 years and provided assistance to over 400 families in 29 Counties. “We were delighted to get the call from Rita advising that the Castletroy Lions Club had selected Cliona’s Foundation as beneficiary of their Annual quiz. 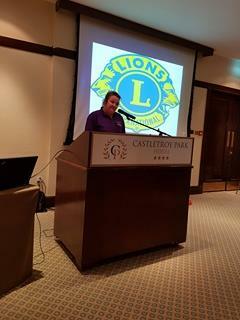 The Lions Club do tremendous charitable work and we have been very lucky to have benefitted from their fundraising activities in previous years. “Cliona’s Foundation relies solely on fundraising events and private and corporate donations, so this event and the monies generated from it are very important to us, to enable us continue support families who need it,” said spokesperson for Cliona’s Foundation Phil Deegan. The money raised from this event will go directly towards providing assistance to a family of a child with a life limiting illness, to help alleviate the pressure and stress associated with the non medical costs, such as car parking charges, accommodation, travel expenses, childcare costs or specialised equipment. “This week we were able to send out cheques to 8 families. For one of these families both children have a life limiting illness and are travelling abroad for treatment with one of them. Both parents have taken leave from work and will be incurring significant costs at home and abroad. “Each year is a challenge in terms of fundraising, and while we are delighted our profile has increased significantly over the past 2 years, that has also meant an increase in the number of applications we are receiving on a weekly basis. Ideally we want to be in a position that we do not have to refuse any family that meet the criteria our support. “It is the many thank you letters we receive back from families that reinforce for us the need that’s out there, the impact that our support has and the drive for us to continue on our journey,” said Phil. 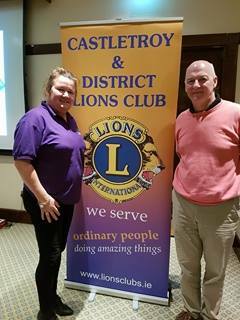 The Castletroy and District Lions Club is a volunteer organisation that organises fundraising events with every penny raised going directly to good causes in local communities All members of Lion Clubs International are committed to serving local communities. 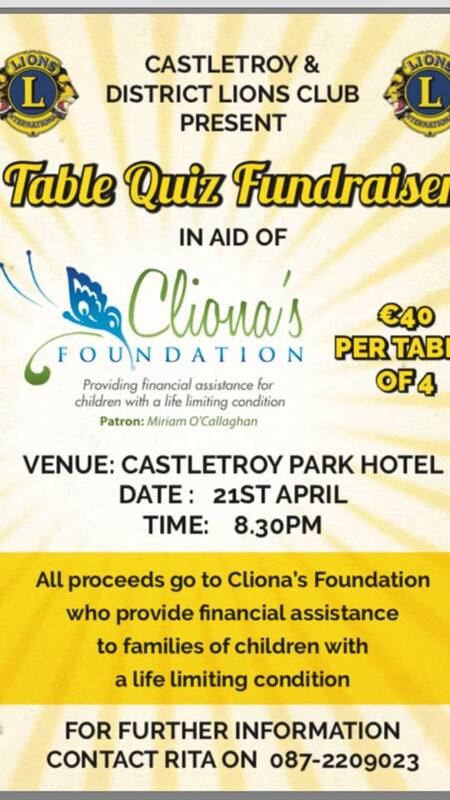 Castletroy and District Lions Club are holding a table quiz in aid of Cliona’s Foundation at the Castletroy Park Hotel at 8.30pm on Friday April 21. “We were delighted to get the call that the Castletroy Lions Club had selected Cliona’s Foundation as beneficiary of their Annual quiz. Tables of 4 are €40 and there will also be a raffle. 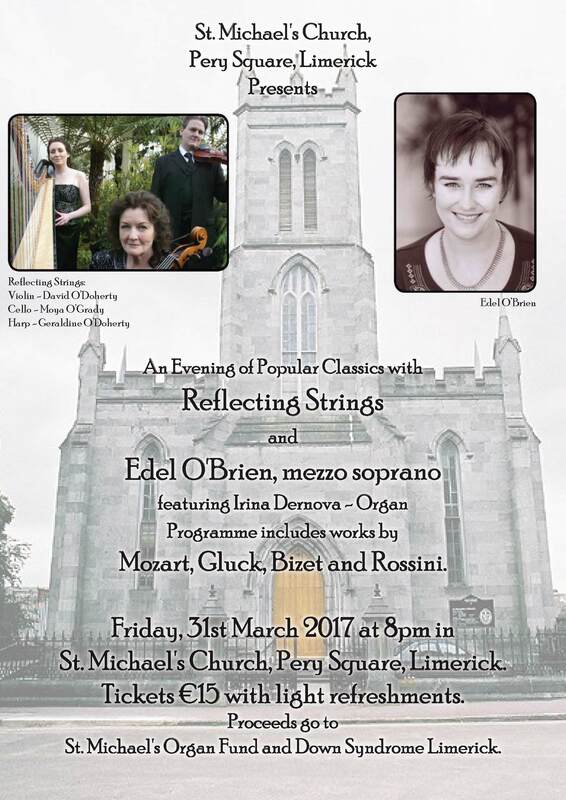 An Evening of Popular Classics, a concert featuring mezzo soprano Edel O’Brien, trio Reflecting Strings and organist Irina Dernova in aid of St. Michael’s Organ Fund and Down Syndrome Limerick will take place at St Michael’s Church, Pery Square on March 31. “I have only had the pleasure of singing in St. Michael’s Church once before. It is a beautiful venue to perform in. The acoustics are excellent,” said Edel. 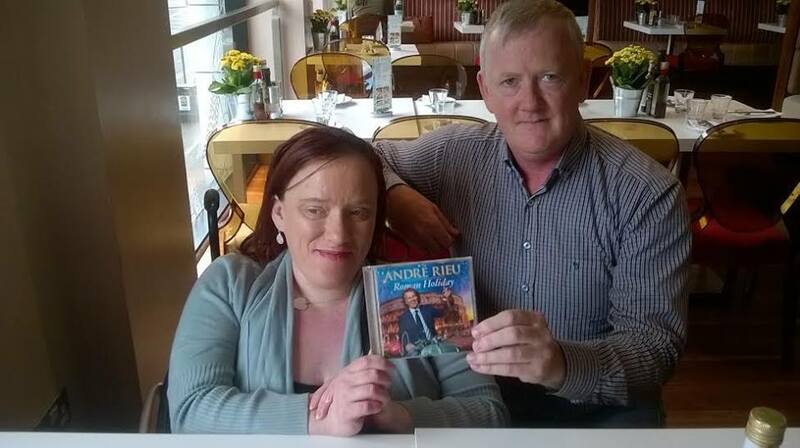 Originally from Kilrush, County Clare, Edel began voice training with Jean Holmes at the Limerick School of Music. Then having obtained a Bachelor and Master of Arts in music from National University of Ireland (NUI) Maynooth, she studied at Trinity College of Music, London, followed by two years at the Centre de Formation Lyrique, Opera Bastille, Paris. Edel has performed as a soloist in Opera de Paris, Opera de Rouen, Opera Ireland, the Anna Livia International Opera Festival, and as a guest soloist with many choral societies throughout the UK, Ireland and France. “It was really Moya who made the final choice of programme. She asked me to find pieces I like to sing and then chooses those that work best when arranged for cello, violin and harp. The programme will include works by Mozart, Gluck, Bizet and Rossini,” added Edel. Moya O’Grady on cello, her son David O’Doherty on violin and daughter Geraldine O’Doherty are Reflecting Strings, a Dublin based chamber group that has recorded five critically acclaimed CDs and toured extensively internationally, one special highlight was a celebrated performance in the Smithsonian Institute, Washington D.C.
Moya was co-principal cellist of the RTE Symphony Orchestra. David studied at the Dublin Institute of Technology (DIT) Conservatory of Music, made his American debut live on Boston Radio and in July 2000, and received his “Premier Prix de Virtuosité” from the Conservatoire of Lausanne, Switzerland. Geraldine has been Principal Harpist with the RTE Concert Orchestra since 2006, and is a teacher at the Royal Irish Academy of Music, Dublin. 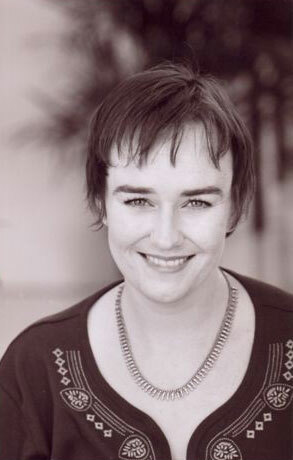 She studied at the Guildhall School of Music, London and at the Hochschule fur Musik in Zurich. She has toured internationally and performed with many groups and has an extensive list of recordings for various artists such as Paul Byrom, The Priests, Celtic Woman, Celtic Thunder and she also features on the soundtrack to the Oscar nominated film, Albert Nobbs. 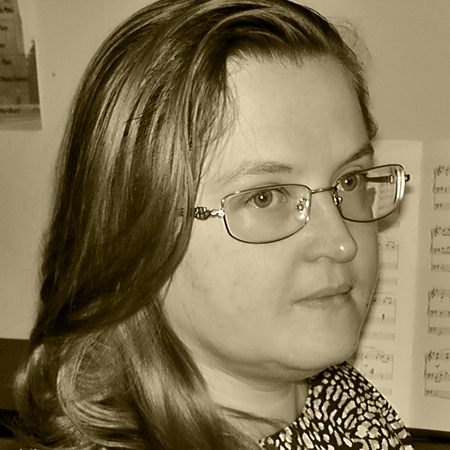 Irina Dernova who is musical director at St. Michael’s Church, and is also a piano teacher at Mid-West Vocal Academy, Lisnagry, and is well known as an accompanist and teacher throughout limerick and Clare, will begin the evening by playing Trumpet Voluntary by Jeremiah Clarke on the organ. “I wish to say a big thank you to Edel and Reflective Strings for offering this concert. The organ in St Michael’s is one of the oldest in Limerick, about 150 years old. It needs funding, a big job was recently done on it, and more work is needed on it,” said Irina. 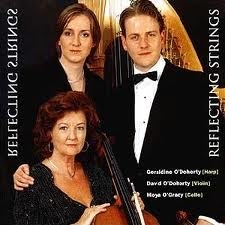 CD’s by Edel O’Brien and Reflecting strings will also be available to purchase on the evening. 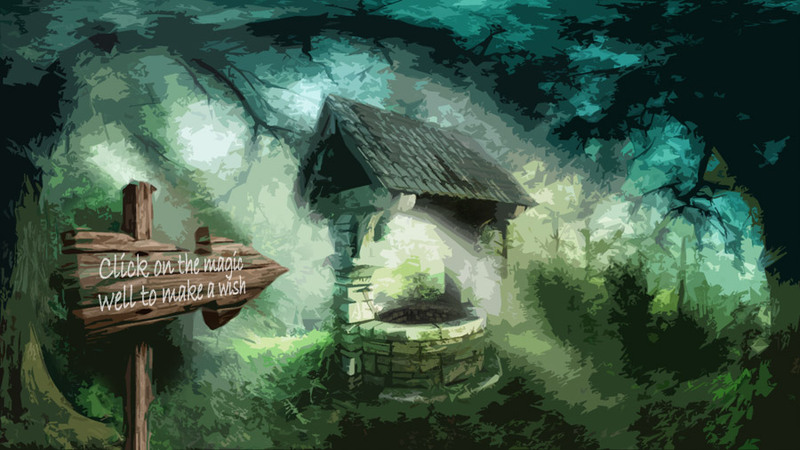 Clare’s Wishing Well, a charity shop supporting Clare’s Wish Foundation, will have an opening celebration at 5pm, January 27, in the Groody Neighbourhood Centre, Groody roundabout, Castletroy. 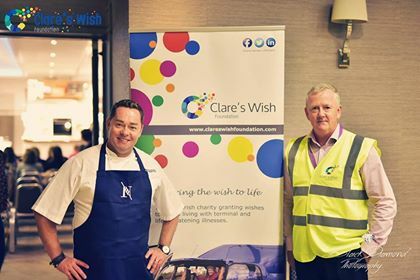 “I hope the shop can raise funds for Clare’s Wish so we can grant more wishes in 2017,” said founder of Clare’s Wish, Kevin Clancy. Named after Kevin’s sister, who was born with Spina Bifida and died at twenty four years of age, more than 30 wishes have been granted since Kevin launched Clare’s Wish in 2013. The Limerick based charity relies solely on fundraising events, the new retail unit, and is the only Irish charity granting wishes to adults living with terminal and life-threatening illnesses. “The charity aims to bring the wish to life, to create ever-lasting memories for the wisher, their family and their friends. Providing respite from the normal routines of hospitals, doctors and treatments,” said Kevin. 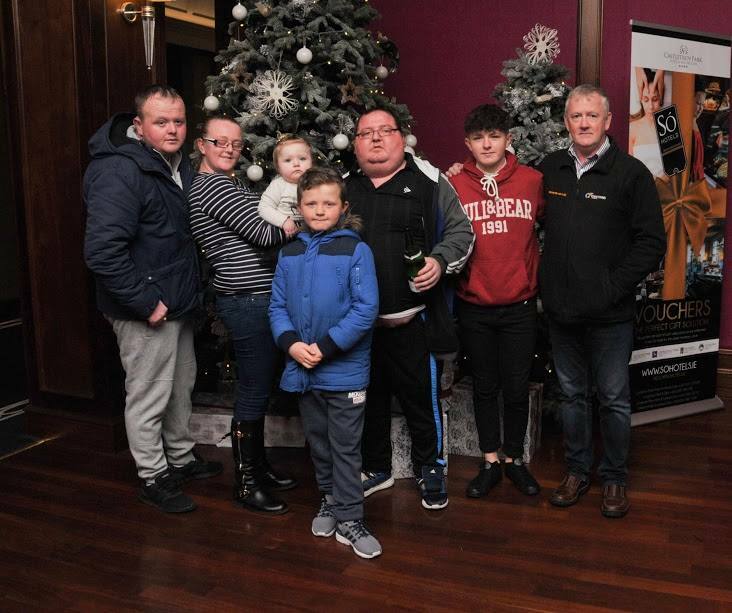 Some of the wishes granted in 2016 were a Disney Paris trip for the Murray Family, a two day stay at the Castletroy Park Hotel for the Donovan family, a special shopping trip at the Dundrum Centre for the Doyle family, a Killarney trip for the Ryan Family, and a Christmas experience for the Spencer family at Foto resort. If people would like to nominate someone they know for Clare’s Wish they can send an e-mail or fill out the application form on the website, where the charity prioritise emergency requests. “We are all excited with this new venture. The retail unit is the very first Charity shop in the Castletroy area, selling donated furniture, clothing, books, with a view to raising much needed funds for Clare’s Wish Foundation. We will have tea, coffee, wine, light food and Emma Langford will be playing for us,” said Kevin. 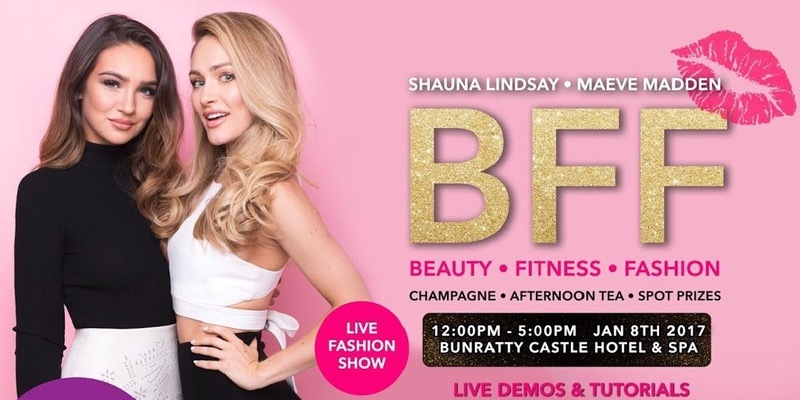 Clare’s Wish Foundation ambassador and model Shauna Lindsay, along with her friend, fitness model and blogger Maeve Madden are hosting a Beauty, Fitness and Fashion (BFF) event in the Bunratty Castle Hotel, January 8. Mark Rogers from Benefit Ireland will be teaching how to achieve perfect eyebrows, and celebrity make-up artist Fiona Murphy (who was trained by Kim Kardashian’s make-up artist), will be demonstrating her top beauty secrets. Maeve will talk about her personal fitness training and nutrition, and Shauna who was voted VIP magazines most Stylish Girl, will be sharing her top street style tips. There will also be a fashion show, goodie bags, afternoon tea, tutorials, questions and answer sessions, and more than a 100 spot prizes to be won. Open from 12pm-5pm, attendees will receive Champagne upon arrival, and €5.00 per ticket sold will be donated to Clare’s Wish Foundation. Named after founder of Clare’s Wish, Kevin Clancy’s sister, who was born with Spina Bifida and died at twenty four years of age, Clare’s Wish Foundation is a Limerick based charity that was established in 2013, and is the only Irish charity that is dedicated to providing wishes exclusively to adults with terminal illnesses. It’s been a busy year for the music department and students of Laurel Hill Coláiste FCJ who will be taking part in the ‘Reach Out’ benefit concert for ISPCC Childline, at the Millennium Theatre on December 16. The choir will perform a fifteen minute programme of Christmas favourites and also join with Music Generation, Limerick City Big Band and lots of other artists for group performances which will include some audience participation. Last April at the Cork International Choral Festival, the choir won the Equal Voice Post Primary National competition for schools and the overall prize for the best school choir of the festival. 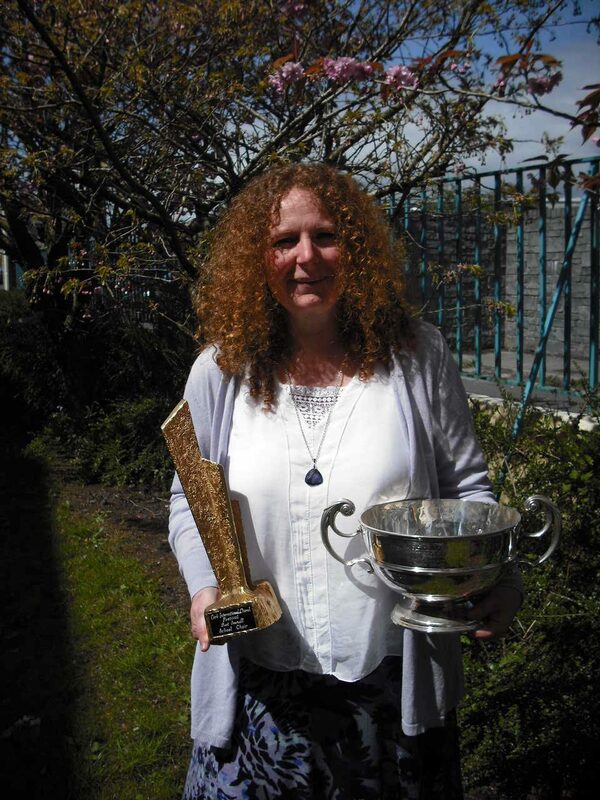 This success came soon after the orchestras performance in the Dublin Feis Ceoil, where they won the Post-primary School Orchestra competition and the RTE Lyric FM award. The choir comprising of 121 students from first to sixth class sang, ‘What Sweeter Music’ by John Rutter, and ‘Ceann Dubh Dílis’ by Michael Mc Glynn, accompanied by students, on drum Laura Drennan and Orlaith Stedje on piano. “It felt fantastic. I’m really proud of them. The girls were so excited, we went down with the expectation to really sing well. I would always say to them once you come off the stage and you feel you have given your very best that’s enough. I don’t think they get nervous I think they just enjoy performing. “It was very special for the sixth years, because they have been with me through everything. I think the younger ones learn from the older ones about their commitment to the choir, they sound so gorgeous the older ones, the first years would be trying to emulate their sound. We were singing in five parts, that was very difficult for them,” said conductor and music teacher Orla Colgan Ahern. The orchestra consisting of 41 students from first to sixth years, having won their competition by playing ‘The Thieving Magpie’ by Rossini and ‘Pavane Pour une Infante Défunte’ by Ravel, were invited to play for the gala concert in the National Concert Hall. “I think it gives them a huge discipline. They get to appreciate lots of different styles of music, they make friends in the choir and orchestra. I hope it instils a love of music, that they can join a choir and be good enough, and to love it. The same in the orchestra, that they would join orchestras when they are in college or if they are living somewhere away, it might be a way in to meet people. “It’s a huge commitment, I think that’s very good, and the focus of it is good, because with a lot of technological things, it can be hard to hold their attention for a long time because they are always on Facebook or things like that, and I think music dispels that and allows them to focus for a huge period of time,” said Orla. In January the choir collaborated with De La Salle College, a boys choir in Waterford to perform Fauré’s Requiem in Waterford Cathedral. “There was a lovely rapport between the two choirs. From the Choral Festival the idea of merging the two choirs came, the idea of giving them a bigger work to do. It was fantastic there were about 200 singers,” said Orla. This year the choir also performed in The Unlucky Cabin Boy in the Limetree Theatre, the Childline concert and Gulliver’s Travels which was written by Myles Breen and consisted of a collaboration of many groups including Limerick Youth Theatre, Coláiste Nano Nagle, Patterns Dance Collective, Limerick Youth Dance, Music Generation Limerick and the Daughters service users. In the past the choir have performed in concert with Anthony Kerns, the Vienna Boys choir and the UL Orchestra to name just a few. They also frequently perform new and commissioned works by composers such Ben Hanlon, Michale Holohan, Seamus De Barra, Elaine Agnew, Kathleen Turner and Michael Mc Glynn. “Every year you have to start building again in the choir and in the orchestra, because you loose fantastic players every June, so you are constantly building and working on them,” Orla added. This year the traditional musicians of Laurel Hill Coláiste, prepared by past pupil Deirdre Ní Mhaoláin also got to the finals of the Siansa Gael Linn, and represented the school at all Ireland level in the National Concert Hall.